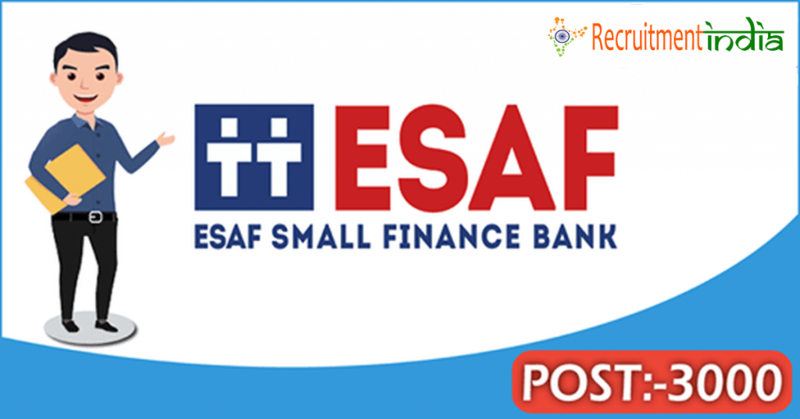 ESAF Small Finance Bank Listed out the Latest ESAF Bank Recruitment Notification 2018 For Selecting the 3,000 Jobs under Sales Officer And its Trainee, Credit Officer, Branch Officer And Its Assistant And Other For Kerala Branch. And the Online Applications from the Bank Job Seekers is accepting until 21.05.2018 through www.esafbank.com in Online mode. ESAF Bank Credit Officer Recruitment 2018: Latest Job Information From the ESAF Small Finance Bank. ESAF Bank Searching for the Experienced Persons of total 3,000 Vacancies in Various Posts like Sales Officer, Credit and Branch Officer and Other. So, the Contenders who are waiting for the Banking Sector Jobs that too in Kerala state, the ESAF Bank Recruitment 2018 is the best Opportunity for them to make use of it. As the 3,000 ESAF Bank Job Notification 2018 is clearly placed on Kerala Employment News, Experienced Job Hunters Firstly need to get the Information about every detail placed to apply for the jobs available. And ESAF Bank Selection Commission asking the Contenders to view the Bank Portal www.esafbank.com to know more Detailed news about the Jobs placed. ESAF സ്മോൾ ഫൈനാൻസ്ബാങ്ക് പുതിയ ESAF ബാങ്കിൽ റിക്രൂട്ട്മെന്റ് നോട്ടീസിങ് 2018 ലിസ്റ്റ് സെയിൽസ് ഓഫീസർ, അതിന്റെ ട്രെയ്നി, ക്രെഡിറ്റ് ഓഫീസർ, ബ്രാഞ്ച് ഓഫീസർ ആന്റ് അസിസ്റന്റ് ആൻഡ് ആർട്ട് ഫോർ കേരള ഫോർ ബ്രാഞ്ച് എന്നിവ തെരഞ്ഞെടുക്കുക. ഓൺലൈൻ അപേക്ഷകൾ 21.05.2018 വരെ www.esafbank.com വഴി സ്വീകരിക്കുന്നു. Though the ESAF Bank Branch Heads Notification 2018 is announced on 01.05.2018, Online Applications is also being accepted from the Experienced Postulants in the Specified Format. Other than, Online Applications Another format the Applications will not be accepted. ESAF Small Finance Bank Officials through this Gets all the experienced one’s information and will verify all of them whether all the Qualifications, Experienced and Age limits are met by them or not. If not respective applications will be cancelled from the ESAF Small Finance Bank Relationship Officer Recruitment 2018. As the ESAF Bank Officials to Fill out the 3,000 Jobs in Mannuthy, Kerala Main Branch, Definitely Applications being Accepted from the India wide and Officials intimated those Registrants to submit the Applications before 21.05.2018 as the Link expires on that date to the Post which the Contenders going to apply on the available ESAF Bank Recruitment Notification 2018. After applying contenders need to prepare the Syllabus placed to crack the selection rounds and get placed to the Job opted by the Contenders about the ESAF Bank Sales Officer Recruitment 2018 and Other. ESAF Bank Officials Scrutinise and Intake the aspirants as per the Rounds intimated in the ESAF Bank Recruitment 2018 Notification and the Contenders need to Get qualify in all the Rounds to get settled in this Jobs. And if any of the contenders fail in any one of the selection rounds, they will not employable for placing in this Job. And the Experience level also is taken into consideration because Some of the aspirants have more Experience and the weightage will be awarded as per the 3,000 ESAF Bank Vacancies in Kerala. And the Bank has the right to Cancel the Application at any point of time and also change in the Vacancies Number. So, the postulants must view this page regularly to get the latest Information updated by the ESAF Bank Officials and For More Government Jobs stay on the page. What Are The Educational Qualifications Post-Wise ESAF Bank Notification 2018? Contenders as per the ESAF Bank Sales Officer Recruitment Notification 2018, need to possess the Graduation and Post Graduation with First Class from any reputed Institution. Contenders need to have the Two Years Of Experience in respective Field applied. What Are The Age Limits For ESAF Bank Recruitment 2018? Contenders should have the Minimum and Maximum Age limit of 21 and 40 Years as on date 30.04.2018 and Age limit is not considered for Higher Experienced Candidates and Senior Officers. How Much Registration Fee Must Be Paid For ESAF Bank 3000 Jobs Recruitment 2018? There Is No Registration Fee charged by the ESAF Bank which is listed on the ESAF Bank Recruitment Notification 2018. What Is The ESAF Bank Recruitment Selection Rounds Involved? ESAF Bank will select the aspirants based on the following rounds. What Are The ESAF Bank Salary Package 2018? ESAF Bank Officials will Offer the Salary For each Post Based on the Qualification, Experience and Performance in Selection Crooks. Contenders who are waiting for this ESAF Bank Job Openings should first need to Check out all the Details which are clearly intimated here in order to get a clear understanding of all the Stipulations and Applying procedure along with List of Jobs placed and after that they can Register for this Kerala ESAF Bank Jobs in Online on or before 21.05.2018 and get ready For facing the Selection Crooks. Soon the Bank Officials will announce Admit Card for the employable ones. And if the aspirants want any Further Info released by the ESAF Small Finance Bank all of them will be updated here on RecruitmentIndia.in. So, the aspirants should stay on this page. What Are The ESAF Bank Recruitment 2018 Enrolling Procedure? On the Homepage choose the Careers Tab and Find the ESAF Bank Recruitment Notification 2018 Placed for each post individually. Applicants choose their Choice of Job and check the details placed clearly. And the Employable ones can Open the ESAF Bank Credit Officer Recruitment Online Application Placed for all the posts individually. Fill the Complete details listed in the Application Form, scan and upload all the documents. Submit the Application in Online and Application Form Hard Copy must be taken by the aspirants.